IMPORTANT SHIPPING INFORMATION FOR THIS ITEM – PLEASE READ BELOW! Snap! bars are an amazing vegan creation that’s so close to a Nestle Crunch® bar that most people would never know which is which unless you told them beforehand. When you’re taste buds are ready to raise the roof and make some noise with a whole lotta toasty, crunchy, crisped rice POW! jammed into a hunk of rice-milk chocolatey BAM!, Holy Candy Bar!, prepare to be knocked out player, SNAP! is the bar for you! For those who are familiar with Go Max Go candy bars, you know you’re getting the most amazing vegan versions of traditional candy bars available. 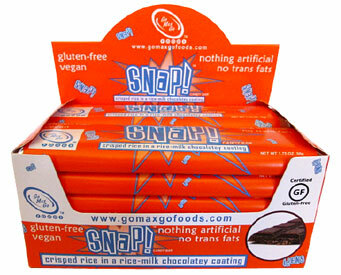 If you haven’t tried Go Max Go’s sweets before, you’re definitely missing out on what has been all the rage in the vegan world. These candy bars are so good, nobody will ever wonder if they’re vegan or not – they’ll be too busy asking for more when they’re done! Snap! bars are 1.75 oz. (50g) in size, and this box of 12 individual bars is just $26.89, which saves you 10% off the normal price! *NOTE* - Chocolate can melt in the summer heat, especially if your destination area temperature is in the mid 80s or above when the package takes more than a day or two in transit. We recommend expedited 2nd Day Air shipping (if you are not normally within a 2-day ship time via Ground service) and the cold shippers for orders where you want to minimize the risk of melted chocolate, and that it is delivered where someone will be there to accept the package at time of delivery (work address if not at home). We cannot accept responsibility for melted chocolates, so please order at your own risk!